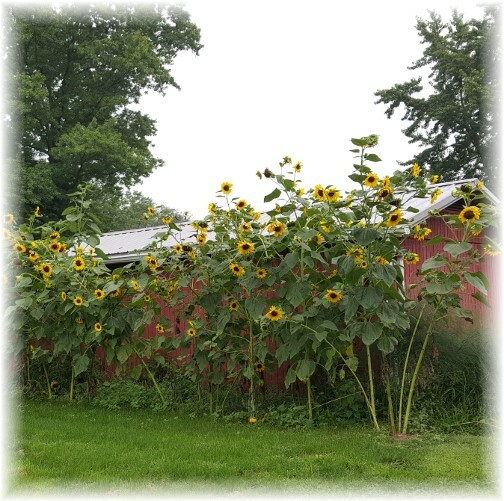 Yesterday we visited a few minutes with John and Faithe Keefer and saw their tall sunflowers and other healthy vegetation. “Let us not become weary in doing good, for at the proper time we will reap a harvest if we do not give up. Therefore, as we have opportunity, let us do good to all people, especially to those who belong to the family of believers” (Galatians 6:9,10). “And as for you, brothers, never tire of doing what is right” (2 Thessalonians 3:13). We could learn from our dog Mollie a characteristic we write about today. She never tires of playing, especially Frisbee toss. Anytime, day or night, all we have to do is say or spell F-R-I-S-B-E-E and from wherever she is she will come bounding ready to go. She is never “not in the mood”. After many tosses she may tire enough to plop down in the yard to chew on it for a few minutes before getting refreshed for another round. Inevitably her owners tire out before she does! Yesterday in the course of our chaplain ministry Brooksyne and I talked to a friend who shared a burden with us regarding his children. He and his wife came to faith prior to their marriage and sought to raise their children for the Lord. However upon reaching adulthood two of their children have departed from the Lord’s ways, creating such a heavy, even sorrowful burden for them. We prayed with the brother and encouraged him to stay faithful and keep pressing on in the ways of the Lord. Those of you who know me personally have likely heard my signature departing exhortation as I often repeat “Stay faithful to God”. 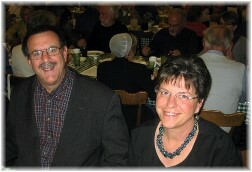 I’ve said this for so many years that people now come up to me and offer, “I’m staying faithful!” or they look right in my eyes and ask, “Are you staying faithful?” Several weeks ago Rick, a pastor friend from New England, wrote “God bless and stay …” Yes, indeed, I am! We all need to have this truth firmly embedded in our lives. Much of that which is popular in the world is not right and too often doing the right thing will not be popular with the world. Today let us each personally consider the Scriptural call to, “Never Tire Of Doing What Is Right”. In the daily text the Apostle Paul is concluding his second epistle to the young Thessalonian believers. The broader context of the passage has to do with some faulty notions these young believers had about the return of Christ. The immediate context deals with living our lives in the daily grind, summarized with the phrase of the daily text “And as for you, brothers, never tire of doing what is right.” That’s a good word for all of us. The real stuff of the Christian life is choosing this particular day and every day to never tire of doing what is right.Bible teacher David Guzek comments: There are many excuses one might offer in explaining weariness in doing good, but they should all be rejected. * “It takes so much effort to keep doing good” – but you will extend effort towards the things of the world. * “It takes so much self-denial to keep doing good” – but it is worth it when we consider the reward. * “It just brings me persecution to do good” – but your persecutions are nothing compared to that which others have suffered. * “People don’t respond and there are little results when I do good” – but remember how slow you were to respond to Jesus Christ. * “It doesn’t earn much gratitude when I do good” – but God sends many blessings even to those who do not thank or appreciate Him. Daily prayer: Father, we enjoy positive results and favorable comments when we do good. But there are many times that we do good or take a position, in accordance to the Bible, that results in our being ridiculed, mocked or even persecuted. Would You increase the importance of eternity in our hearts so that we don’t become weary of doing good and always expect reward here and now. Help us to remember, in many instances, the proper time that we reap a harvest will not be on this side but on the other side of eternity. Above all, remind us through Your Holy Spirit, that we choose to do good because it pleases You. May the fulfillment of pleasing You be of much greater importance than pleasing or impressing those among us. We pray this in Jesus’ name. Amen. 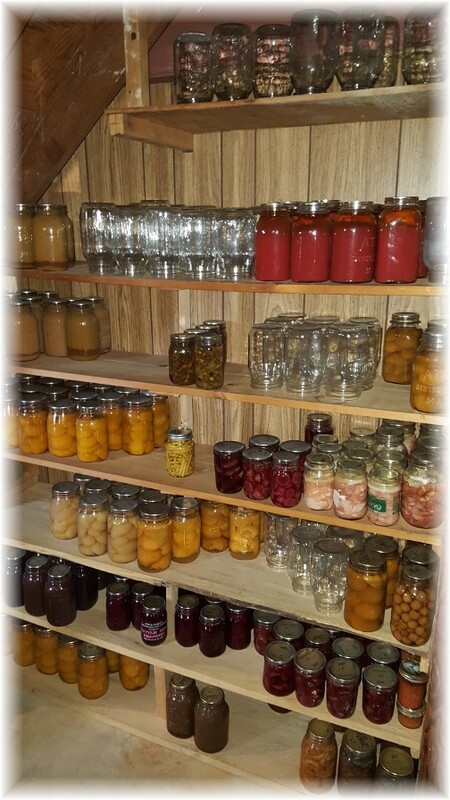 Yesterday we visited with Jesse and Wilma Dourte our ninety+ year old friends and took a look at their pantry. They had just canned over 40 quarts of apple sauce and gave most of it to family members. We hope to have that kind of ambition if we reach our nineties! Jesse Lapp sent a couple more photos over from the Old Windmill Farm. He is a budding photographer with excellent composition in this photo! Brooksyne sure would like to bring this little goat home, but we just don’t have the facilities to raise a goat, so we’ll just enjoy the visits and photos.